The fractionation process begins when raw crude oil comes into the facility from the tank trucks, and goes through a series of preheats into the big crude furnace. The crude oil is super-heated, then moved into the fractionation tower. In the tower, crude oil is separated out into three main byproducts – base oil, fracturing fluid, and wax solvents – which are then collected. All of the oil products are processed and maintained by very tight controls, provided by the Ignition system, that maximize the yield that the facility gains from the crude oil process. 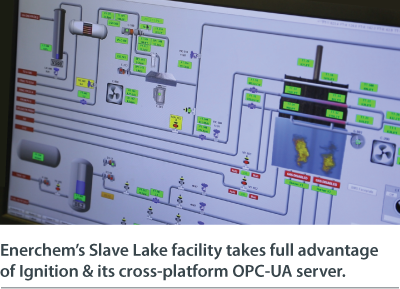 Before using Ignition, Enerchem’s Slave Lake fractionation plant was using an outmoded HMI system that required a lot of attention from the personnel. “With previous HMIs we’ve used in the past, we had to have two to three operators on each panel to be able to control it,” says Kevin Bouchard, director of plants and terminals for Enerchem. “The existing system that was in place had a lot of flaws,” says Kyle Chase, CEO of Kymera Systems. With over 25 years of combined experience, Kymera Systems is a Canada-based systems integrator that primarily serves the oil and gas industries of Western Canada, and also works in the water, waste water, manufacturing, and asphalt industries in Alberta. “It was reporting using a different vendor’s package, it was exporting to a very primitive database, and all the reports were made up in Excel. It wasn’t very manageable or accessible,” says Chase. With just over 30,000 tags, the fractionation plant was in need of an HMI/SCADA system that could allow them to manage the entire facility with precise controls and with a far higher level of efficiency. 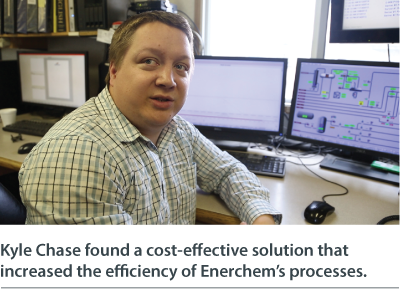 Taking full advantage of Ignition and its built-in, cross- platform OPC-UA server, Chase and his Kymera Systems integration team helped Enerchem build a cost-effective system that has increased the efficiency of the plant’s processes. The Kymera Systems team started out by taking Enerchem’s old system, which lacked the accessibility and manageability that the plant needed, and introducing Ignition. With Ignition’s flexible Java-based platform, Kymera Systems was able to customize Enerchem’s system to fit their needs. They implemented a database, which boosted the ease of use for all of the operators and allowed easy access to years and years of data produced by the facility. OPC-UA, sharing live plant information between them. Kymera Systems also set up remote access, as well as individual user accounts. All of these helped to organize the plant and increase the efficiency of the operators. By providing greater access to data, the plant could get more done using a smaller number of people. 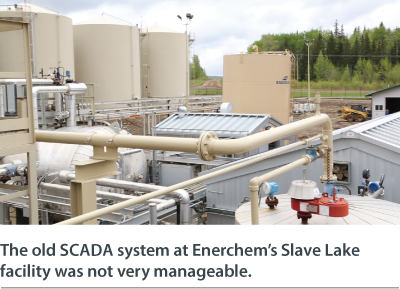 The Enerchem Slave Lake facility has now used Ignition for five years. The software has increased efficiency at the plant and helps the operators accomplish more. One operator can control 10 to 15 different processes at a time, instead of having two to three operators on an HMI panel, reducing labor costs and boosting work output. With their use of Ignition, Enerchem has remained at the forefront of technology and is respected as a leader in its industry.